Well, I promised you when things opened up I would report as much as I can for you. Where to start 樂…. I’ll start with the Missouri River near Bismarck-Mandan. If you have been out or driven by the river, I think everyone knows things have opened up and people are fishing. The water is clearing up quickly, and as the water clears and warms the fishing will continue to get better and better. My fear is most of the local fish are getting cleaned out right now and we need a push of fish from the masses held up in lower Lake Oahe to slide up and replenish all the spots. 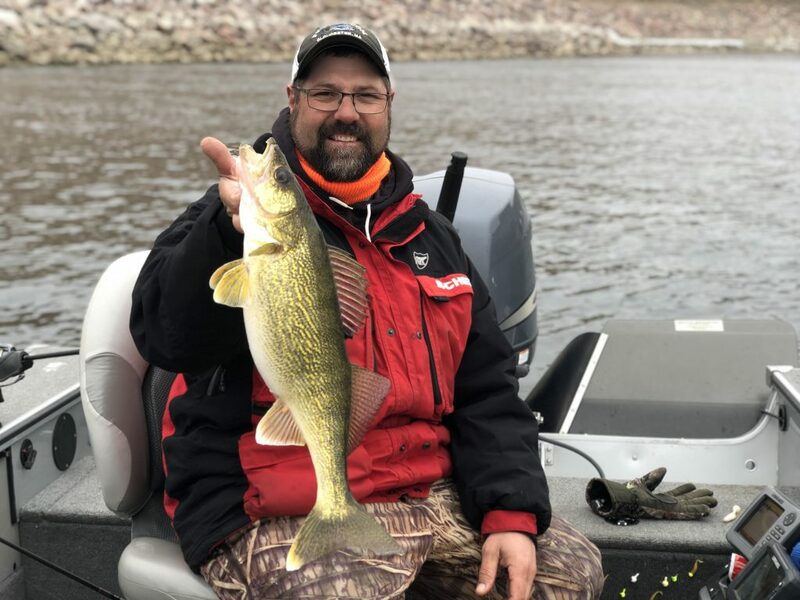 This happens every year and it’s all part of the process of the early spring walleye bite on the big muddy. It’s a mix of fish and size here locally at thre moment. Ive seen pictures and heard of a few big girls being caught. Me personally, I haven’t caught anything big yet? I’m guessing with the amount of guide trips coming up, I should stumble into a couple good ones I hope. Jigs and minnows both pulled up stream and vertical, with some pitching, is producing bites. With the dirty water, when a Walleye hits right now in this section of river, the bite is pretty violent! Love this time of year! The spots are pretty slow drifts off the main channel right now, and I anticipate it only getting slower with reduced flows and also water backing up from down south. If it stays like it is, I feel we will see a repeat of 96-97. Only time will tell what happens I guess. I’ve also been spending time up north in the tailrace region out of Pick City, ND, and things remain steady. This isn’t a bite for the faint of heart. It’s a grinders type deal with tough navigation. You will really need to position yourself well and pay close attention to detail. Small jigs and the biggest minnows you can find in the bucket are a must! I have scattered dates here in April and more in May if your looking to book a trip! Feel free to get a hold of me at mikepelusooutdoors@gmail.com or messenger me and let’s book a trip on this awesome body of water! The walleyes are waiting!